Cables from proposed wind farms off the Norfolk coast that will slice through the Reepham district could have a major effect on the road network and cause massive disruption to soil and crops, according to the manager of two local farm estates. 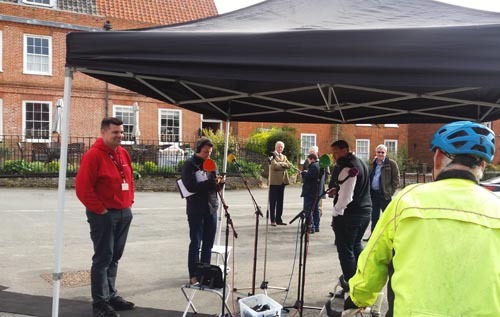 Speaking to BBC Radio Norfolk, broadcasting live from Reepham Market Place on Wednesday 25 April, Poul Hovesen, manager of the Salle and Heydon Estates, expressed concern about the impact the projects will have on the roads around the estates and on the fields. Energy companies Vattenfall and Ørsted have put forward plans to build offshore wind farms and distribute the energy generated through almost 120 kilometres of underground cables across Norfolk. The cable trenches are planned to cross just outside Reepham. Vattenfall recently decided to use high-voltage direct current (HVDC) technology rather than the more common high-voltage alternating current (HVAC) technology to transmit power from the wind farm site via Happisburgh on the coast through to a massively extended National Grid substation at Necton near Swaffham. The Swedish state-owned company said the deployment of HVDC for its Norfolk Vanguard and Norfolk Boreas offshore wind farms will require a narrower onshore cable corridor and avoid the need to build cable relay stations. Danish energy group Ørsted, however, has yet to announce whether it will use HVDC or HVAC transmission technology for its Hornsea Project Three offshore wind farm, with onshore cables running from Weybourne to a new substation at Swardeston, south of Norwich. Stuart Livesey, Ørsted’s project development manager, noted that, to date, HVDC for offshore wind farms has only been trialled in Germany. However, Mr Hovesen commented that Ørsted was “loading” the estates with paperwork and would not commit to the length of time the excavations would take, with up to eight years of disruption. The estates’ worst-case scenario was Ørsted not committing to the less-intrusive HVDC technology, he said. If planning approval is granted, the Vattenfall cables will come into Reepham from the north of Cawston, across the B1145 Cawston Road near the “Christmas tree farm”, where they will cross with the Ørsted cables on arable land owned by the Salle Estate. The Vattenfall cables will again cross the B1145 Cawston Road, then Wood Dalling Road near World’s End Lane, crossing Kerdiston Road and Marriott’s Way, then to the east of Pettywell, crossing the B1145 Dereham Road then Marriott’s Way again, across Nowhere Lane and Jordan Lane, heading towards the A1067 Fakenham Road west of Bawdeswell. The Ørsted cables will come in from Heydon and through Salle, where they will cross the B1145 Cawston Road and Vattenfall’s cables, crossing Marriott’s Way and heading towards Reepham Moor and through Booton, crossing Church Road then Norwich Road near Little Witchingham. The working corridors alongside the trenches for construction traffic will be 45–80 metres wide, depending on whether the energy companies decide to go with HVAC (80 metres) or HVDC (45 metres) technology. Like others contributing to the programme, Mr Hovesen said an offshore ring main system near the coast should again be considered and included in national policy so the Norfolk countryside would not be affected. A ring main could feed into the existing electricity infrastructure, which would mean no trenching across the county and also no need for new substations or relay stations. In 2012 a project team was formed with representatives from National Grid and the developers of the three largest offshore wind zones off the east coast of England, where an offshore ring main connecting multiple wind farms to the mainland was considered. The conclusion of their 2012 report was that offshore wind capacity was unlikely to reach the 17.2 gigawatt (GW) contracted levels in timescales required to make an “integrated design” (i.e. an offshore ring main) beneficial or economically viable. They concluded that pursuing a “non-integrated design” (i.e. lengthy onshore cable routes to new or existing substations) would allow National Grid and the wind farm developers to maintain closer control over their individual work programmes and “minimise risks for consumers and investors”. However, Norfolk County Councillor Greg Peck said this decision reflected a lack of forward thinking from National Grid. Currently, an offshore ring main solution would require National Grid building new 400 kV overhead power lines from its existing high-voltage network to the coast, according to local resident Ray Pearce. These power lines are around 10 km from the coast at Walpole in Suffolk, but could be connected over uninhabited, reclaimed fenland. Nuclear power stations at Sizewell in Suffolk and Bradwell in Essex are on the coast and both have 400 kV connections, he told Reepham Life. This would require minimal input from National Grid and would be miniscule compared with almost 120 km of buried cables across Norfolk. With their current proposals, the two wind farm projects will almost certainly cause disruption to traffic, with partial road closures and diversions. Graham Everett, Broadland District Councillor for Reepham Ward, noted that while Ørsted has undertaken to use trenchless technology using horizontal directional drilling for all road crossings, thereby avoiding road closures, Vattenfall has not been prepared to make this commitment. However, Reepham Town Council chairman Les Patterson believed the energy projects will not affect the town in the long term, with Vattenfall’s excavation work at least being carried out over a relatively short period. The main depot for construction vehicles for both projects will be at Oulton. However, the companies have yet to come up with a traffic management plan over what could be an eight-year timeframe for Ørsted’s project, said Cllr Peck. The wind farm projects are likely to provide a significant number of good quality jobs in Norfolk, although not in Reepham. Mid Norfolk MP George Freeman hopes this will help create a “flagship project” and wants to see Norfolk as a leader in renewable energy. He did agree with Cllr Everett that both projects were extremely difficult to fully understand and that residents looked to their local councillors and MPs to ensure the right decisions would be made. Mr Freeman wants to bring Vattenfall and Ørsted together with Norfolk MPs, town councils and county and district councillors and take the information back to local people. Vattenfall will be answering residents’ questions at the Annual Reepham Town Meeting at 7 pm on Wednesday 9 May in the Town Hall, Church Street, Reepham.